Features excellent versatility for paper and PE bags. performance in both powder and granular applications. 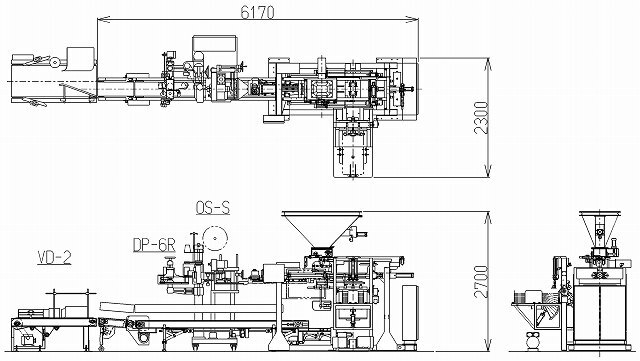 The model 3CM-3 automatic packaging machine for heavy duty bags handles various bag materials such as paper, PE, and PE woven-cloth. It is suitable for many kinds of powder and granular products. This system is used extensively in many industries, exhibiting excellent performance and contributing to plant optimization. The new design is more compact more efficient, and with more economical specifications. Operability and safety have also been upgraded to meet user needs. 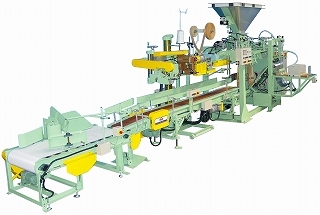 The machine handles a variety of bag types simply by changing the bag sealing section. Any type of weigher can be connected. Capacity※1 600 bags / hr max. ●The machine shown in the drawing includes optional devices. ●The dimensions in the drawing vary with the specifications. ●Specifications may be changed without prior notice. ●Reproduction without permission is prohibited.